Our 'Fast & Easy' end of the week meal: fried rice. 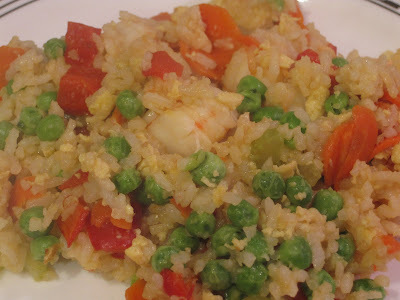 Rice with peas, carrots, red pepper, shrimp, egg, and celery! Yes, celery. SP wanted extra veggie and we have celery to use up. It's OK in the fried rice. He added sriracha to his; I stuck with plain old soy sauce.